Camp Clinton entrance in 1943. 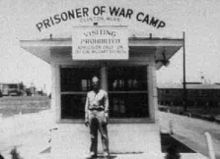 The sign reads "Prisoner of War Camp Clinton, Miss." Founded in 1823, Clinton was originally known as Mount Salus, which means "Mountain of health". 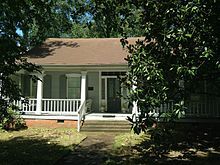 It was named for the plantation home of Walter Leake, third governor of Mississippi, which was located in Clinton and built in 1812. In 1828, the city changed its name to Clinton in honor of DeWitt Clinton, the former governor of New York who led completion of the Erie Canal. The first road through Mount Salus/Clinton was the Natchez Trace, improved from a centuries-old Native American path. 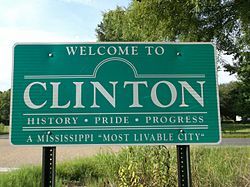 Currently Clinton has three major highways that pass through the city: the Natchez Trace Parkway, U.S. Route 80, and Interstate 20. Mississippi College, a Christian university located in Clinton, is the oldest college in the state of Mississippi. It was founded January 24, 1826 as Hampstead Academy, the second male college in the state after Jefferson College. Mississippi College is the second oldest Baptist university in the world, and was the first coeducational college in the United States to grant a degree to a woman. Clinton is home to sports teams known as the "Clinton Arrows" and "Mississippi College Choctaws". Hillman College, originally for women, was founded in 1853 as Central Female Institute, supported by the Central Baptist Association. It changed its name in 1891. Mount Hermon Female Seminary, a historically black college, was established in 1875 by Sarah Ann Dickey. It closed in 1924 as students moved to co-educational institutions. The Clinton-Vicksburg Railroad was the second oldest in the state, incorporated in 1831. It contributed to the export of 20,000 bales of cotton annually from this city, the most of any city between Vicksburg and Meridian. Cotton from three surrounding counties was shipped through Clinton and by rail to Grand Gulf on the Mississippi. During the Civil War, Confederate forces, as well as Union troops— the latter commanded by generals Ulysses S. Grant and Sherman—briefly occupied Clinton on their way to the Battle of Vicksburg in May 1863. Grant had mistakenly believed that John C. Pemberton, a Confederate general, would attack him at Clinton. Grant finally took Vicksburg in this campaign. In September 1875 during the election campaign, a Republican political rally was held in downtown Clinton, where 3000 people were gathered and expecting Governor Adelbert Ames and other prominent speakers. White insurgents disrupted the rally, attacking blacks in what was called the "Clinton Riot." It resulted in the deaths of several white men and an estimated 50 blacks later that night and over the next few days. More armed whites arrived by train and widely attacked blacks. Among the black victims were schoolteachers, church leaders, and local Republican organizers. Whites had been attacking black and white Republicans in every election cycle, and that year the paramilitary Red Shirts arose in the state as a force to intimidate blacks and suppress black voting. The governor appealed to the federal government for protection and the U.S. government sent more troops. But election-related violence continued through the fall and, together with fraud at the polls, resulted in white Democrats regaining control of the state legislature and, in 1876, the governor's seat. This political shift signaled the end of the Reconstruction era, confirmed when the federal government withdrew remaining troops in 1877. During World War II, Camp Clinton was established as a German POW camp south of town; it housed about 3,000 German soldiers. Most of the prisoners were from the Afrika Korps. Of the 40 German generals captured in the war, Camp Clinton housed 35 of them. The German soldiers provided the labor to build a replica model of the Mississippi River Basin for the U.S. Army Corps of Engineers, used for planning and designing flood prevention. Clinton, the smallest city to ever host a Fortune 500 company, was the headquarters for WorldCom from the mid-1990s until 2002. It went bankrupt due to what was at the time the largest accounting scandal in U.S. history. The financial dealings resulted in fraud-related convictions of Bernard Ebbers, CEO, and Scott Sullivan, CFO. The company changed its name to MCI and moved its corporate headquarters location to Ashburn, Virginia. Verizon, MCI's successor, owns SkyTel (no relation to Bell Mobility's Skytel brand). It still occupies the massive former WorldCom compound in Clinton. On April 15, 2011, an EF3 tornado struck the city at about 11:00 a.m. CDT. It produced damage near Interstate 20, which included total destruction to the BankPlus building. Malaco Records was destroyed as well. Ten people were injured by the tornado. According to the 2010 United States Census, the city has a total area of 42.147 square miles (109.16 km2), of which 41.822 square miles (108.32 km2) is land and 0.325 square miles (0.84 km2) is water. As of the census of 2010, there were 25,216 people and 9,328 households in the city. The population density was 598.3 per square mile (231.0/km2). The racial makeup of the city was 59.4% White, 33.8% African American, 0.2% Native American, 4.1% Asian, 0.0% Pacific Islander, 0.1% from other races, and 0.9% from two or more races. Hispanic or Latino of any race were 1.5% of the population. The average household size was 2.54. The median income for a household was $56,539, and the per capita income was $26,398. About 9.1% of the population was below the poverty line. As of the census of 2000, there were 23,347 people, 8,328 households, and 6,079 families residing in the city. The population density was 979.2 people per square mile (378.1/km²). There were 8,899 housing units at an average density of 373.2 per square mile (144.1/km²). The racial makeup of the city was 74.92% White, 22.53% Black, 0.10% Native American, 1.54% Asian, 0.02% Pacific Islander, 0.26% from other races, and 0.64% from two or more races. Hispanic or Latino of any race were 0.87% of the population. There were 8,328 households out of which 35.9% had children under the age of 18 living with them, 56.0% were married couples living together, 13.8% had a female householder with no husband present, and 27.0% were non-families. 23.1% of all households were made up of individuals and 8.4% had someone living alone who was 65 years of age or older. The average household size was 2.60 and the average family size was 3.08. In the city the population was spread out with 24.7% under the age of 18, 14.9% from 18 to 24, 27.6% from 25 to 44, 21.6% from 45 to 64, and 11.2% who were 65 years of age or older. The median age was 33 years. For every 100 females, there were 89.3 males. For every 100 females age 18 and over, there were 84.3 males. The median income for a household in the city was $47,092, and the median income for a family was $53,482. Males had a median income of $38,194 versus $27,458 for females. The per capita income for the city was $20,586. About 5.7% of families and 8.0% of the population were below the poverty line, including 9.8% of those under age 18 and 11.7% of those age 65 or over. Clinton operates as a Code Charter form of government, divided into six Wards. The local governing body consists of the mayor, one Alderman representing each of the six Wards and one Alderman-at-Large whose duty is to represent the entire community. As of July 3, 2017, Philip R. Fisher, a retired major general in the Mississippi National Guard, is the city's mayor. The Board of Aldermen are Dave Ellis (Ward 1), Jim Martin (Ward 2), Bill Barnett (Ward 3), Keith Perritt (Ward 4), Jan Cossitt (Ward 5), Mike Cashion (Ward 6) and Ricki Garrett (Alderwoman-At-Large). At one point WorldCom (now Verizon) was headquartered in Clinton. In 2003 the company announced that it would move its headquarters to Virginia. Automotive component manufacturer Delphi Corporation operated a plant in Clinton from the early 1970s until its closure in 2009, making cable and wiring connectors. When Delphi closed the plant in late 2009, with the loss of 280 jobs, production moved to Delphi's Warren, Ohio facility. The local community college is Hinds Community College. The City of Clinton's public schools are served by the Clinton Public School District. Jackson Hines Library System operates the Quisenberry Library in Clinton. 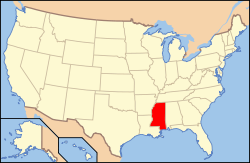 The Mississippi Brilla is a soccer team competing in the United Soccer Leagues Premier Development League (PDL), a league outside of the American Soccer Pyramid, and play in the Mid-South Division of the Southern Conference. They play their home games at Traceway Park in the city of Clinton. Mandy Ashford – singer, model, and member of Innosense. Keith Carlock, jazz drummer and Mississippi Musicians Hall of Fame inductee, was born in Clinton in 1971. 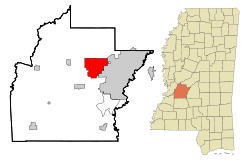 ^ a b "Clinton city, Mississippi". Profile of General Population and Housing Characteristics: 2010 Demographic Profile Data. United States Census Bureau. Retrieved January 28, 2013. ^ John Keegan (1987). "Grant and Unheroic Leadership". The Mask of Command: A Study of Generalship. Pimlico (Random House). p. 214. ISBN 1-84413-738-4. ^ Unattributed (April 15, 2011). "Malaco Records destroyed by tornado in Mississippi". Oregon Music News. Archived from the original on July 18, 2012. Retrieved April 16, 2011. ^ a b "U.S. Census Bureau: State and County QuickFacts". United States Census Bureau. Retrieved March 16, 2012. ^ "Military Service". Phil Fisher For Mayor of Clinton. Retrieved November 7, 2015. ^ "Quisenberry Library." Jackson Hines Library System. Retrieved on December 29, 2018. ^ Chisholm, Chad (2008). Clinton 1940-1980. Arcadia. p. 62. "In September 1958, the Dorcus Class of Morrison Heights Baptist Tent Ministry (pictured above) stopped for a quick snapshot after their Sunday lesson. Morrison Heights' tent ministry was on the eastern outskirts of Clinton. The massive Baptist Baptist church today at 201 Morrison Drive began as a missionary branch of the Clinton First Baptist Church on College Street, and Morrison Heights Baptist Church became independent in 1958 with 126 charter members."